View cart “2019 Silver Streak 18’6″ Gambier Cabin” has been added to your cart. Made popular by “island folk”, the Silver Streak Cabin model is a great craft for colder climates and inclement weather. An enclosed cabin with a solid aluminum bulkhead offers complete protection from the elements. The lockable cabin is perfect for securing belongings while moored or parked, and this craft can be left out in all weather conditions. This model is an excellent commuter on the waterways - so load up with groceries, friends and family and get to your destination at any time of the year! As with all of our vessels, these cabins are safe and built to last. Using the same robust hull design as the Race Rocks, the Carmanah takes it to the next level of class and usable comfort. 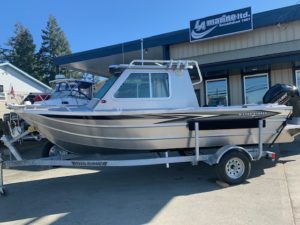 Sporting full upholstery, abundant locking storage, stainless steel hardware and suspension pedestal seating, this vessel offers endless amenities and comforts to enhance your boating experience. 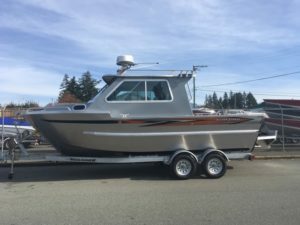 The list of standard features and attention to detail is what makes this boat stand out on the water. The Carmanah Hard Top is a low maintenance model for those that leave their boats in the water. 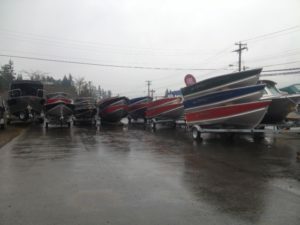 Throw some crab traps on the roof, add some rod holders and enjoy this salty boat! The Silver Streak ‘Phantom’ Special Edition is our “25 years in business" model and is proving to be a huge success! Designers took the Renfrew hull and completely reconfigured the cabin and added a comfortable cuddy. With sleeping quarters and an optional head there is no hurry to get home. 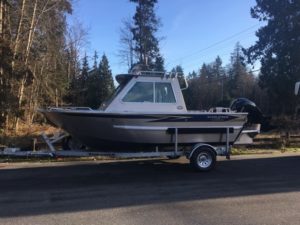 This particular design answered the need of a small and trailerable sized boat with "big boat" amenities and without the big fuel and moorage expenses. The sleek contoured lines and remodeled hard-top with a one-piece hull make the design of this boat stand out both in functionally and style.